We awoke at dawn to see the sunrise, the 30 Cape Buffalo and 10 Kenyan Giraffe roaming near the lodge. We took a lot of photos. We learned that the 1962 John Wayne movie "Hatari!" was filmed at the lodge just to the east of Oldonyorok. We ate another fabulous meal and then Eliahu drove us to view game in Arusha National Park. We saw about 20 different species. 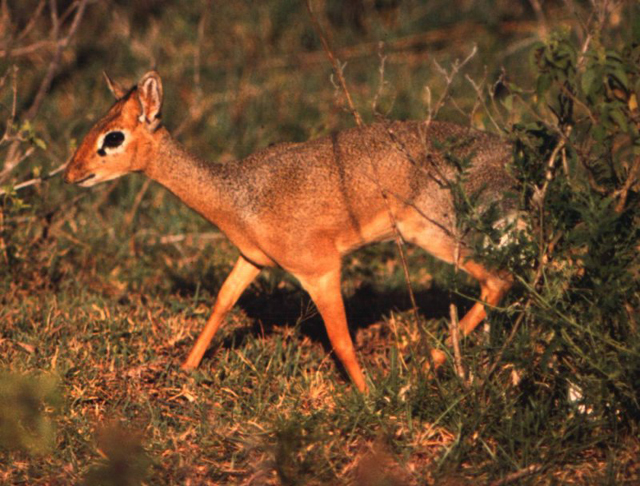 I spotted a pair of Phillips's Dik-dik (small antelope) and Eliahu told us that Dik-dik mate for life, so we all started singing The Turtles' "So happy together:"
"I can't see me loving nobody but you for all my life / When you're with me baby the skies'll be blue, for all my life." We debated on the name of what turned out to be an Acacia tree. 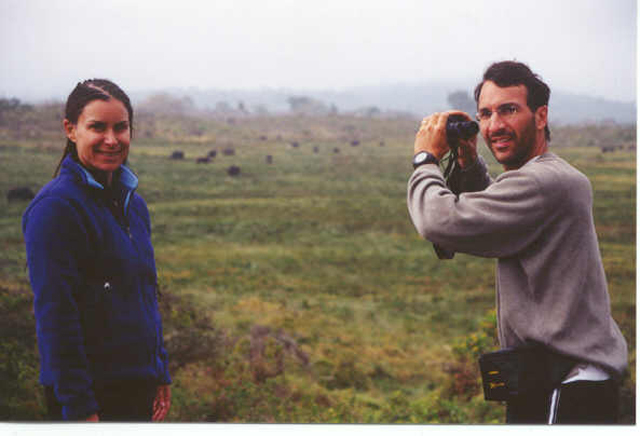 We saw a Cape Buffalo rubbing his back in the mud and Peter said, "That guy's well endowed." We saw two baboons carrying their young on their back. Peter called the baboons "chaps." We saw Bushbuck, Guinea Fowl, White Fronted Bee-eaters, Egyptian lion geese, Black-Winged Stilt Birds, Spur-Winged Birds, Silver-Cheeked Horn Bills and Greater and Lesser Pink Flamingos. Andy said, "It's so alive here." Larry added, "Look at the life the ducks have. They have it made." We stopped at the intersection of Leopard Kill and Buffalo Point roads and watched a variation of the Blue Monkey called the Sykes Monkey jumping between branches. We counted four Abyssinian Black-and-White Colobus Monkeys leaping between trees. Those large white-cape-wearing creatures fascinated us. We drove on past a large crater. We sang "Hakuna Matata" when we saw a Warthog. Back at the lodge we ate another fabulous meal. Frank said, "They're fattening us up before the slaughter." Kapanya came to each of our rooms and checked our equipment. He took one look at Larry's gear and asked, "Where do you think you're going? Mt. Everest? Who is your sponsor?" Then he gave Larry the name "Mr. Perfecto." We took a one-hour hike and set our eyes on Kilimanjaro for the first time. We started getting excited. My Camelback bladder sprung a leak and I had to throw it out. Helene loaned me her extra bladder for the duration of the trip. Back at the lodge, Deirdre was the only one who got a hot shower, but I'm not holding any grudges. Really. Andy had a stomachache and asked for some Mylanta. If it's yellow, let it mellow / If it's brown, flush it down. Kapanya and Sekeyan gave us our trip briefing. Kapanya spent a lot of time talking about how summiting is a team effort and that we should not be macho and we should follow the guides' pace and listen to their suggestions. Specifically, if a guide offered to carry our daypack, we were supposed to accept the offer. We discussed acute mountain sickness and the garden toilet etiquette. Kapanya told us that "the cranky zone" starts at about 17,000 feet and that one way to combat crankiness was to eat chocolate. After dinner, in my room, I tried to screw in a light bulb for more light and I ended up blowing out the entire electrical system in both buildings. Helene and I were hysterical. Larry was frantic because now he couldn't charge our camera, video and satellite phone batteries and there was no electricity during daylight hours.